When , Lily, the baby of our family, asked if she might take part in a foreign immersion program in grade eleven, my heart stopped beating. If the youngest of our four kids left at only 16 years old – her Dad and I would be sitting smack in the middle of a shockingly empty nest. Our friends and family couldn’t shut up about the EMPTY NEST prospect, constantly reminding us that it loomed around the corner. What was with that? Were they all watching to see how we would replace the noise, and chaos, comings and goings, organizing and meal planning, and endless discussing that goes on when you have kids at home? Were they waiting to see how we would manage when too many of our evenings and weekends became unfathomably quiet. Their curiosity was well founded. I pondered that uncertain future along with them. After two decades of kids, kids, kids swarming around us – what the hec would we do? I might have suggested we take up ballroom dancing – seeing as we are so often hanging out in ballrooms, but I had already played that card. Apparently, around ten years into a marriage it was what wives got husbands to do. It felt like such a coup when Will agreed. His not wanting to do it previously, didn’t translate into him not being able to do it. Will fox trotted and two stepped, and cha cha cha –ed across the gym floor with the rhythm and musical ease he was born with, sometimes with the wiry male instructor, after he’d given up on clumsy, impossible to teach, tone deaf me. I sympathized with our kids who always had to beg me to let them quit any activity – music lessons, karate, choir, baseball – whatever. Will made me stick out that ballroom gig right up to the last ungainly swing dance. One of Will’s younger work colleagues suggested we get a puppy. Her parents had fostered puppies when she and her siblings all left home. She couldn’t know that Will and I are considered by some of our nearest and dearest to be anti-pet. These friends have been known to get all misty-eyed and accusatory and say, well, I know you hate my dog. Hate is a strong word, and hey, if I lived in the country I might even acquire a dog to protect me from all the things in the country that make a doggie bark at night. Most of my reluctance to the city dog, has to do with the poo (and maybe the hair on the couch, slobber on my leg, and kibbles everywhere.) So no ballroom dancing or puppies to fill the emptiness we might feel sans kids at home. The year I turned forty-eight, I took lessons in both knitting and outdoor in-line skating. In-line skating was okay, but I’ve yet to find an in-line skating partner. 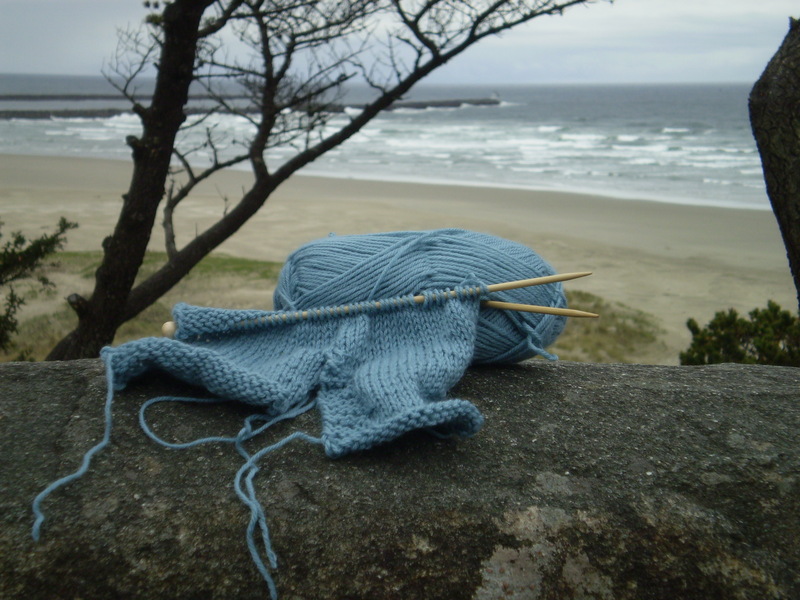 Knitting passes the time on planes and long drives. That same year Will bought his dream machine – a midnight blue sports car. Will confessed that while he was aware that young people did knit, watching me knit made him feel old. He failed to understand that driving in the low slung car made me feel old, too. I had to concentrate to gracefully get in and out of it, but also, I tried to explain to my oh-so proud husband, that when we drive down the street, radar detector on, seventies music blasting, I am on to the meaning of that visual double-take pedestrians give us. It says – was that an old guy, who can finally afford a cool sports car, playing old guy Led Zeplin tunes, and if it was, I don’t have to be envious because I’m not old yet (glance again) yes, it was, old indeed, oh and look, his wife is knitting. So I suppose we will be diverted from our emptynest-ness by planning two-seater driving trips to places old people go – Waterton Park, Yellowstone Park, and Mount Rushmore, while I knit loose lope-sided teeny sweaters for Zoë’s friend’s new babies. My approach to Lily’s request to do the immersion program had been completely hands off, not wanting the blame in any way should she call from a far away place to say she was so, so sad and lonely. Maybe the whole foreign immersion idea would fade away, as teenage ideas often do, before being replaced with the next half-baked scheme. But Lily was a take charge kinda girl and had the whole application process rolling neatly along on her own, right up to the day we received a phone call to say that the Cultural Immersion people needed to send a staff person to our home to interview Lily, Will, and I as part of the in-depth study of the prospective applicant. My brain whirled – could this be our out? Could the wrong answers spare Will and I the possibility of more badly chosen classes or fostered pets and keep little Lily home with us? Tune in to Thursday’s post to find out….